Avevo conosciuto Kenji Ekuan al congresso ICSID del 1983, tenutosi a Milano, il tema essendo Dal Cucchiaio alla Città, il fortunato aforisma di Gropius. Avevamo scambiato idee, ed era nata, tra noi, una simpatica sintonia. Ci siam visti, poi, in occasione di congressi o fiere del mobile – egli veniva, non tutti gli anni, al Salone del Mobile – ci salutavamo brevemente, ma era come se continuassimo un discorso interrotto la volta precedente. It was my honourable opportunity I could meet you in Milan. I have been deeply grateful to you for the elaborate congratulation mail for the award. To deserve the honour of the award, I would like to do my best from now on, too. Hoping to seeing you sometime someplace. La sua morte mi ha colpito, ed ho intensamente pensato a lui, svegliandomi all’ora di inizio del suo funerale, che ebbe luogo il 12 febbraio scorso, di cui presento qui qualche imagine, insieme con il mio messaggio alla sua compagna, la cara Sumiko Onodera. This morning I have waken up at 4 am Italian time, and I have been silent for one minute, and, closing my eyes, i have intensively thought of Kenji. He was a person whom – despite we have met a few time from the first time, when he was attending the ICSID Conference in Milan, in 1980, and since that time he told me that he liked Italy – a felt as a very esteemed friend. I have put in my wallet, so close to my brain and heart, the cards I have received from him every New Year. On the last one it was written “Light links east and west around the Globe”: a presentment ? Farewell, my dear Kenji:YOU have been a light linking East and West. It has been so quick passing almost two months since Mr. Kenji Ekuan passed away on February 8th. We deeply appreciate so many people sending very heartwarming condolences. 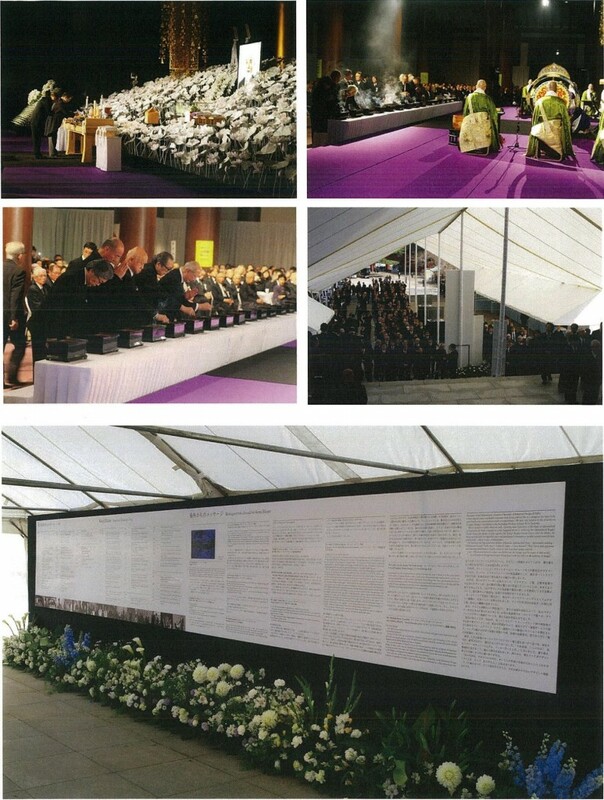 On March 17th, we have held a funeral as a corporation at the large hall named “Daiden” of Zojoji tempie in Tokyo, with more than twelve hundreds moumers attended in smooth process. Though raining the day before the funeral, it tumed out to be a fine and even warm day under the clear sky. 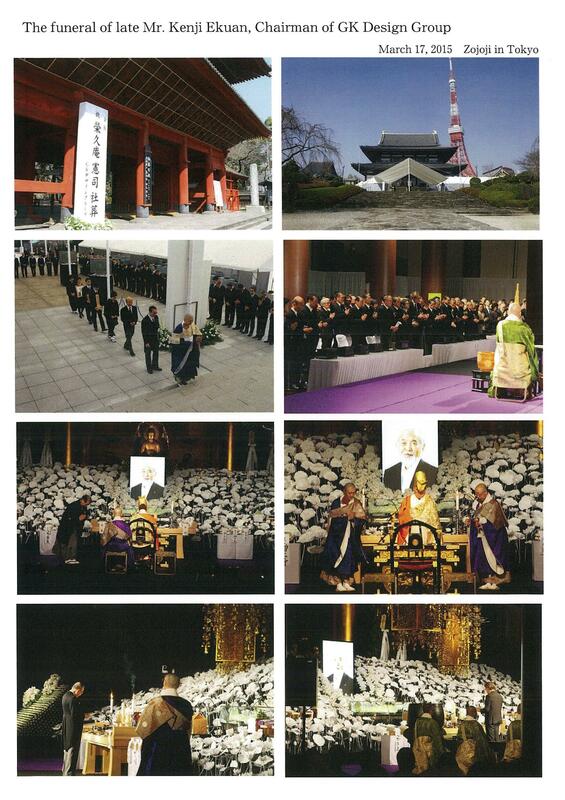 The venue “Zojoji” is a famous Buddhism Jodo Sect tempie to which late Mr. Ekuan belonged as a priest and he had wished during his lifetime to have his own funeral at the tempie. 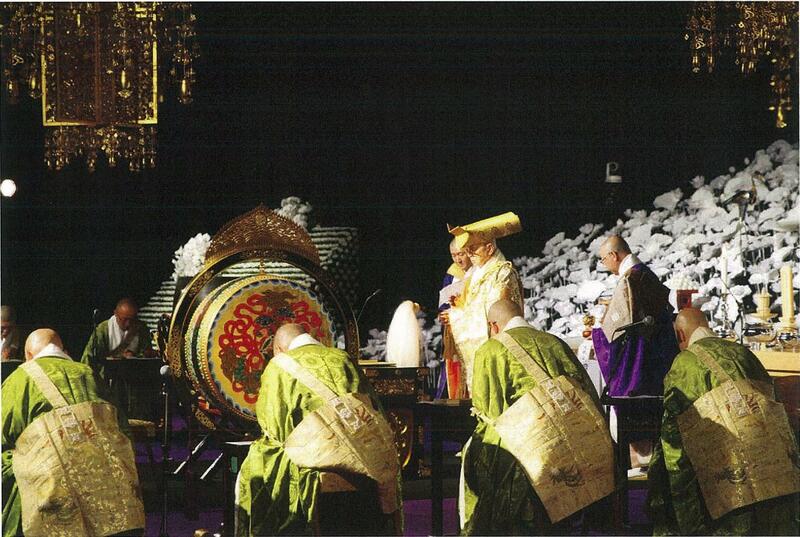 A priest offering a chant of sutra was Mr. Kisho Yagi, titled as Daisojo Daika, ranked highest of the priests of the tempie. The funeral was conducted in very solemn and tranquil atmosphere. The altar was surrounded by the set named “Chichu Lenge” expressing the scene a bird was singing and a butterfly was flying in between dense iotus leaves of the pond of the Pure Land. 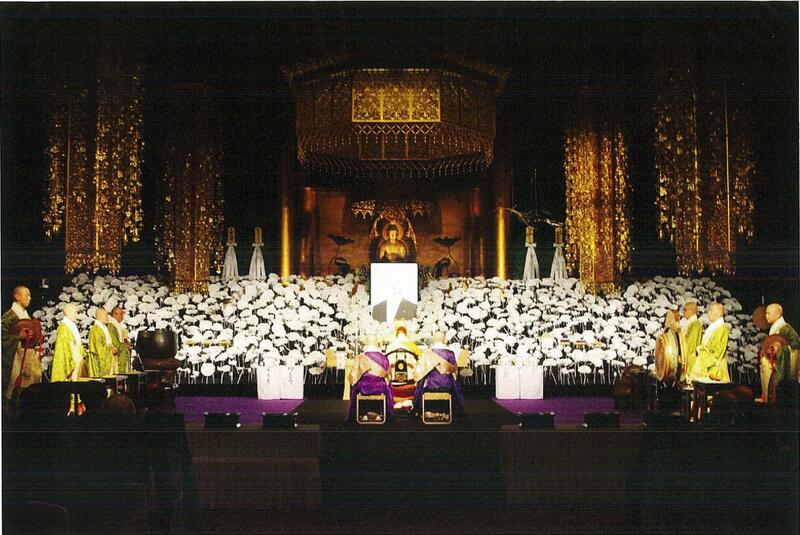 Late Mr. Ekuan designed the set in his lifetime with his direct image of the Pure Land. Condolences that you sent to us were displayed on the panels for the mourners’ comfortable viewing. The mourners gave us a message with one accord that it was very heartwarming and good funeral. Late Mr. Ekuan’s great track record that he had come through in eighty-five years of design field will be valued over the world. His gentie personality loved by everyone might be ever remaining in people’s mind worldwide from now on. We again thank you from the bottom of our heart for your favor and support for his lifetime. Thank you so much.